Here are some facts about Robert the Bruce. 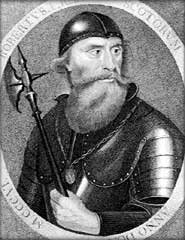 Robert the Bruce, or Robert I, was King of Scotland from 1306 until his death in 1329. He is known for the important role he played in leading the way for Scottish independence. Robert was known as the Bruce, as he was considered to be the head of the Bruce family. Most people then spoke French or Gaelic and they referred to the head of the family that way. He was born in Ayrshire, Scotland in 1274. At an early age, he spoke 3 languages, Gaelic, Scottish and Anglo-Norman, and probably worked as a servant for his father and grandfather. After the death of William Wallace, Robert was determined to win Scotland’s independence from England. He and his men attacked England several times, but were defeated each time. Robert I was crowned as King of Scotland in 1306, and soon controlled all of Scotland. He held his first Parliament in 1309 and received the support of the church the following year. During this time Robert and his men were often chased with bloodhound dogs by the English. On one occasion, he avoided capture by waking just before the enemy arrived. Robert the Bruce was encouraged to continue his fight against the English, by watching a spider try to climb up a cave wall. The spider kept failing, yet finally succeeded on the 13th attempt. One of his biggest victories was at the Battle of Bannockburn in 1314, when he defeated a large English army. The victory led to the establishment of an independent Scotland. Robert the Bruce died in 1329 and was buried in Dunfermline Abbey. His tomb was carved in Paris and decorated with gold leaf, some of which can still be seen today. There are several statues of Robert in Scotland, including one in Edinburgh Castle, and his image has appeared on Scottish banknotes. An aircraft has also been named after him.